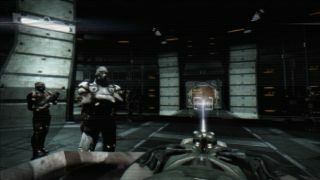 Released yesterday to commemorate the start of QuakeCon 2014 , the Quake 4 mod False Dawn is a non-linear, multiple-goal mission with up-to-date graphics, overhauled health and damage systems and even a story that actually has some meat on the bone. I can't vouch for any of these claims because I haven't actually played it, but False Dawn does sound promising. It takes place an unspecified number of years after Quake 4 and puts players in the role of a Stroggified Marine, perhaps not the most creative twist ever but presumably necessary to the story, which involves intercepting Strogg communications as a significant plot device. False Dawn updates its visual elements through the use of the Sikkmod and also offers original, if maybe a bit dodgy, voice acting. More intriguingly, it promises a "meaningful story" about a plot to destroy humanity "that is not as black and white as it may first appear." The trailer playing above was actually released in December 2012 so how much similarity there is to the final release is hard to say, but it looks pretty cool anyway and, more the point, the developers haven't seen fit to release a newer one. There are an estimated 90 to 120 minutes of fresh Strogg-shooting action in the mod, which of course requires Quake 4 to play, and while that's not a huge amount of gameplay, it's free, and it's not like you're at QuakeCon, right? Pick it up at ModDB.com .